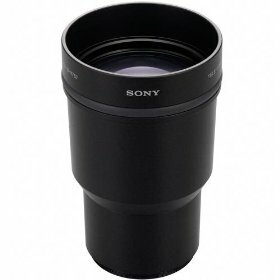 This post is a compilation of annotated links to Sony VCL-DH1757 Tele-Angle Conversion Lens for the DSC-HX1 reviews, user opinions, photo samples and resources. The DH1757 tele lens screws directly on to the Sony Cyber-shot DSC-HX1 without the need for any additional adapters or mounting tubes [source]. Some HX1 plus DH1757 test shots by “Barbyte”, consisting of a baseball game, red-tail hawk’s nest, bird close-ups and far-away birds.